In the period ended Dec. 31, quarterly net income rose to $579 million, or $3.63 per diluted share, compared with a net loss of $274 million, or $1.65, a year earlier. Revenue climbed to $6.1 billion compared with $5.4 billion in the same quarter in 2017. Increased truck production in North America and stronger demand in global construction and power generation markets drove the majority of the revenue increase. Currency negatively impacted revenue by 2% primarily due to a stronger U.S. dollar, according to the Columbus, Ind.-based company. 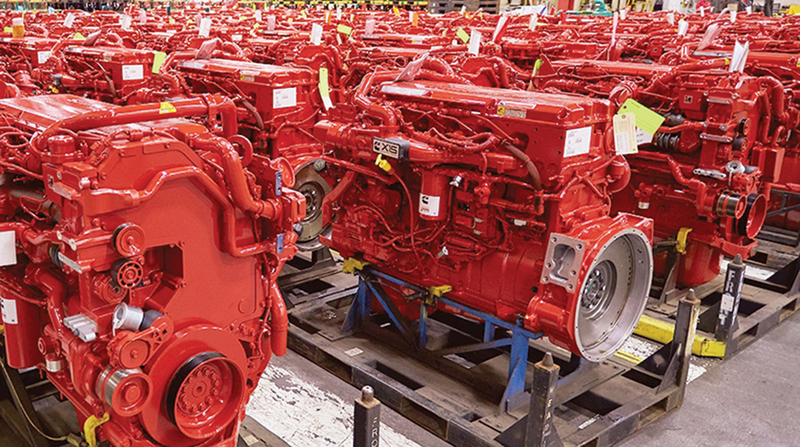 In the quarter, Cummins’ engine business posted the highest revenue of all segments, $2.7 billion. In the engine segment, heavy-duty truck engine revenue soared to $959 million in the quarter compared with $730 million a year earlier. Medium-duty truck and bus engines increased to $687 million compared with $643 million a year earlier. The components segment posted revenue of $1.7 billion, up from $1.5 billion a year earlier. That included $792 million from emissions solutions and $135 million from automated transmissions, compared with, respectively, $689 million and $95 million a year earlier. Meanwhile, fourth-quarter results included a loss in earnings before interest, taxes, depreciation and amortization of $58 million related to a write-off of an investment in an electronic logging device business, and the valuation of assets related to its nonqualified benefit plans, according to the company. Full-year net income was $2.1 billion, or $13.15, compared with net $999 million, or $5.97. Consolidation of Eaton Cummins Transmission Technologies joint venture in the third quarter. Creation of the Electrified Power Business Segment. Acquisitions of Silicon Valley-based Efficient Drivetrains Inc. — which designs and produces hybrid and fully electric power solutions for commercial vehicle markets — and Johnson Matthey Battery Systems to develop high-energy battery materials for commercial heavy-duty applications. At the same time, Cummins announced in July it would voluntarily recall 500,000 model-year 2010-15 medium- and heavy-duty trucks to replace a defective catalyst in the emissions control system. The campaign is the largest-ever voluntary recall of medium- and heavy-duty trucks, according to the U.S. Environmental Protection Agency. It came after a recall begun in 2016 of 232,000 Dodge Ram 2500 and 3500 vehicles with pre-2013 Cummins engines. Recalls for those vehicles were approved in July 2016 and July 2017, respectively, and are underway. Those vehicles and the latest medium- and heavy-duty trucks all produce excessive amounts of smog-forming nitrogen oxide. Cummins has set aside $404 million to cover all related expenses; $181 million of that is slated for the truck recall. The company’s products range from diesel and natural gas engines to hybrid and electric platforms, as well as related technologies, including battery systems, fuel systems, controls, air handling, filtration, emissions solutions and electrical power generation systems. Cummins serves customers in 190 countries and territories through a network of 600 company-owned and independent distributor locations and 7,600 dealer locations.